Developer claims that it's "far more than just another reverb"
UltraSpace will be released in December. 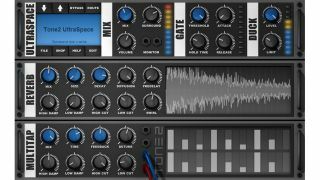 Tone2 has revealed details of its latest plugin, an 'ambience modeller' that goes by the name of UltraSpace. The company is keen to stress that this isn't 'just another reverb', pointing out that it contains various effects that cover different aspects of 'space simulation'. UltraSpace is modular in design, meaning that you can combine its effects however you wish. There is, naturally, a reverb module, while the Multitap device is a stereo effect that's been included to help you add groove. There are also duck and gate modules, along with a surround control. Shipping with 150 built-in patches, UltraSpace will be available in December in VST/AU formats for PC and Mac. Expect it to cost $79/€59 - keep an eye on the Tone2 website for more.